Wayland is a peaceful community located in the MetroWest area of Massachusetts, situated at the halfway point between Boston and Worcester. 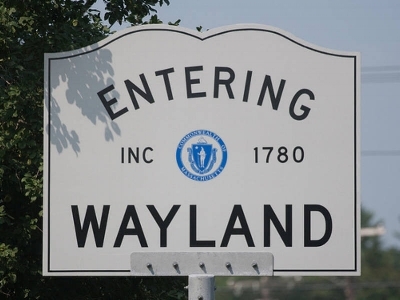 While Wayland is located in an area that provides easily accessible shopping, sightseeing, dining and entertainment, the town itself remains a quiet bedroom community in a semi-rural setting with little industrial or commercial base. Wayland is the home to many urban professionals due in part to its peaceful setting and its close proximity to the city of Boston. In addition, Wayland is an ideal community to raise a family, as its school system is known as one of the finest in the state. Wayland also takes great pride in its preservation of the forests, marshes and fields that surround the Sudbury River. These natural resources provide residents an opportunity to enjoy these areas for passive recreation.